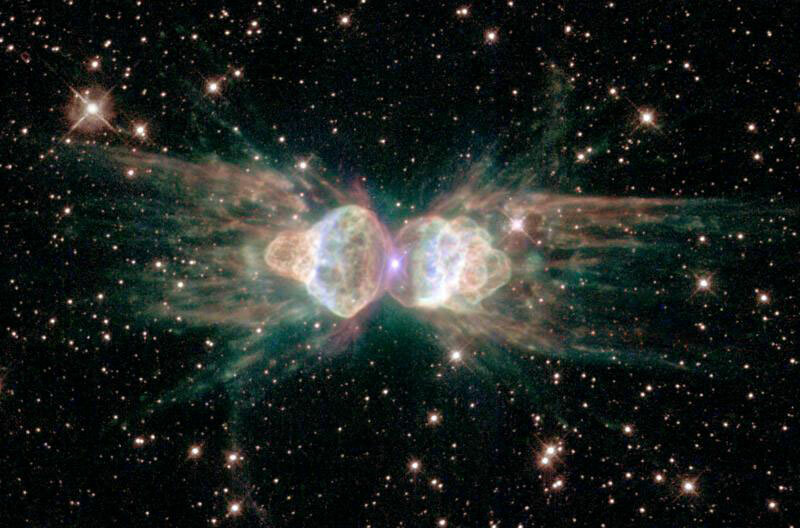 Because of its particular shape this planetary nebula is called Ant. Two lobes of material, expelled by the old central star, are unusually symmetrical. To explain this some astronomers believe that there is a mate whose gravity causes tidal effects on expelled gas and tends to stretch it; according to others the star has a powerful magnetic field which produces a stellar wind, millions of times denser than the solar one, which shapes the material around the force lines. Credits: NASA, ESA and The Hubble Heritage Team (STScI/AURA).